The Apple iPhone 6 leak season is now upon us. Information, specs and photographs allegedly showing the next iteration of Apple's icoic smartphone, have been coming out of the woodworks. 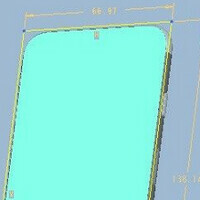 The latest leak shows off "3D" schematics of the phone. These pictures come to us from China and supposedly were snapped (in low resolution) by someone with a connection to the supply chain. The first thing that hits you are the rounded corners on the device, which dovetails with many of the other leaks we've seen of the phone. The dimensions on the schematic reveal a phone measuring 138.14mm x 66.97mm. Unfortunately, there is no measurement relating to the thickness of the device, although it does appear to keep the extremely thin design that we've seen before. As a comparison, the Apple iPhone 5s is 123.8mm x 58.6mm. The power key has been moved to the right, supposedly to improve the grip on the phone, and the volume buttons are now elongated. In addition, the flash has changed to an oval design from the lozenge used on the iPhone 5s. Yes, you should take this with a grain of salt, especially now when iPhone 6 leaks are all over the place. It is perfectly fine to cast a cynical eye on the images, even if you believe that the next iPhone will look just like this. Looks quite impressive I must say in terms of the design. Now the only thing is the pricing. I would respectfully disagree. That looks hideous, they literally made a thinner iPhone 3G with less uniformity. Lol that username. Diet lmao. O_O looks like M$ Fanboyism paid off. You never know when to stop do you? Don't worry bro. The only Android in that list is the Moto G.
;-( Y U DO DIS. I failed to sell high end droids to you. Whats so beautiful about it? There are more than 100 android phones that looks much better than this. Why? It's MUCH more ergonomic on the right side. If it's on right side you can naturally move your thumb and press it, but if it's on the left side then you have to change the position of the whole phone in your hand to stretch one of your fingers to the button. Unless you're left handed then it's the opposite. And when it's on top it's just unergonomic no matter which handed you are. I don't mind having to stretch my finger if the button placement prevents me from always pushing the power button. I wouldn't necessarily call it a big problem. Just annoying from time to time. I don't know how it's even possible to hit it accidentally. I haven't done that a single time in my life. Normally I wouldn't respond to you, but since you're being mature today, I'll respect your post Art. Typically I hold my phone with my left hand, with my 5s's lock key being on the top right, it's not in the area of my grip. I have to purposely move my finger to hit it. With my n3 it's right in the way of my grip, soon as I pull my phone out, I naturally grip the upper half, inadvertently hitting it 90% of the time. Even with my right hand it happens, my hand are decently long, but very wide. Thanx for the mature response too. I like the power button on the right hand side just under the middle finger. Guess it's possible to hit it accidentally then. I like when I can just hit it when I want without any stretch. On my N9 it's impossible to just press it when you don't want to. It's not that responsive. Though I think I've been behaving quite mature lately anyways lol. jedii you know i dont like the ios but i feel the same way with my gs3 and many other units made today if i take it out of my pocket (left side) my left thumb hits the vol down at the same time as power and when in landscape watching a video i hit the vol up and down 80% of the time, the only way i see to fix this on all units is have the vol rockers about 1 to 2 inch up from the bottom left side, and power in the center top back corner near the camera. I have that same problem on my Note 3. I actually got used to the power button on the top after using the One for 6 months. Either way, I am liking the overall design of the phone. Depending on the screen, I might actually purchase my first iPhone this year. That drives me nuts man, I'd love to see Samsung move it up top. So, you don't like the size of the note 3? I'm torn between getting the 4.7 or the 5.5 inch iPhone. I'm concerned that the 5.5 might be to big though. What size iPhone do you plan on getting? idk, I think 4.7" would be a great choice especially when coming from a 4" display. 5.5“ is great for people who want to do more on their iphone I guess. 4.7 to 5 in perfect for almost most hands and optical use of a phone. i would get the iphone 4.7 if the ios8 looks better and they stop the lock down i get so mad when i look at the ios because the browser is a compass and i am like why the hell is it a compass then i see the compass and ahhhhhhhh i think the ios 8 needs new looking keys like the app store pencil and stuff make it mature and common sense like. i am at the age where all i do is use the phone for some texts and work calls, and float online and and download some songs to listern to while working on a roof ect.